Looking to 10 years from now, if energy storage achieves its full potential then the whole landscape for power generation and distribution could change drastically. PV with batteries: a threat to CSP? For the last half-decade or so, CSP has struggled to compete with solar photovoltaic (PV) technology because of the low cost of the latter. Seeking to find a source of competitive advantage, developers have scrambled to incorporate thermal energy storage (TES) into their plants, giving CSP something that PV cannot offer: the potential to provide dispatchable generation. Despite adding to plant costs, this dispatchable capacity is highly sought after by many grid operators, enabling CSP with TES to command a premium and potentially secure a place in major renewable energy markets such as California. Unsurprisingly, then, the CSP sector has embraced TES wholeheartedly in recent years, with storage technologies (usually based on molten salt) becoming a standard feature of modern plant designs. It would be unwise of the sector to become complacent about the benefits of TES, however. PV, and indeed other variable-generation technologies such as wind, can also provide energy on demand when coupled with electrical storage systems such as batteries. And while the latter have until now been prohibitively expensive for widespread use in a grid setting, there are signs the cost of batteries could be about to plummet. PV-and-battery combinations are already more competitive than traditional energy sources for off-grid applications such as mobile phone base station power, where maintenance and fuel costs can be reduced by almost 99%. And, as figure 1 below shows, PV with storage is nearing its payoff point in the German residential market. Homeowners in Germany installed 4,000 PV and battery systems in the year to May 2014. Most sources agree that PV-connected battery storage is set to take off in a residential setting, with EuPD predicting a 20-fold increase in Germany over the next four years, for example. 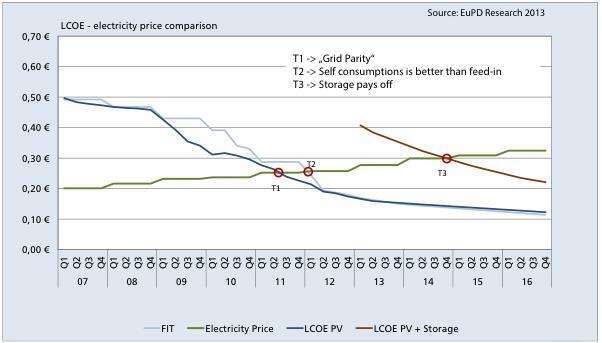 Figure 1: Grid parity for PV with storage in the German market, including feed-in tariff (FIT). For now, the perception is that electrical energy storage remains costly when deployed at scale. At grid level it remains more cost effective and energy efficient to deploy traditional forms of energy storage, such as pumped hydro. Nevertheless, some solar developers are starting to investigate the potential of large-scale battery storage tied to PV. SolarCity of the US, for example, announced in April that it had created a Grid Engineering Solutions department with a focus on energy storage. And Solar Grid Storage, a firm launched by former PV company executives, is looking to deploy PV-tied storage projects of up to 10MW. Lithium-ion (Li-ion) batteries are the technology of choice for most of these early projects, but other electrical storage concepts could become more economical. Redox flow batteries, for example, are simple to engineer and scale because they essentially consist of big tanks of electrolyte. A number of redox flow energy storage projects are already in operation around the world. In Japan, for example, a 4MW facility from Sumitomo is used to smooth out wind-generated energy peaks. Primus Power is building a 25MW plant in California, again for grid-scale renewable energy integration. And while most redox flow projects so far have been based on vanadium, new variants such as zinc-bromide or iron-chromium (being trialled by EnerVault for solar energy storage in California) could further reduce costs. The potential for imminent growth in the energy storage market is evidenced by the interest from major investors. In May, for example, Khosla Ventures, Bill Gates and Karen Pritzker of the Hyatt Hotel family group became among C-round investors in Ambri, a liquid metal battery start-up promising unrivalled cost savings. And back in 2008, Warren Buffett’s Berkshire Hathaway bought 10% of BYD, cars-to-mobiles manufacturer with a focus on the automotive and grid-scale energy storage sectors. In fact, Bloomberg last year reported that a number of erstwhile solar investors, including Silicon Valley funds such as Khosla and VantagePoint Capital, were switching their attention to energy storage. Although Li-ion batteries remain a favourite because of the scale offered by major manufacturers such as Panasonic and NEC, the focus of investments covers the gamut of energy storage technologies. Eos Energy Storage, for example, has attracted backers such as NRG Energy for its zinc hybrid cathode battery technology. Meanwhile LightSail, a compressed-air energy storage company, leapt to prominence after securing funding from Khosla, Gates, Facebook investor Peter Thiel and French petroleum giant Total. The picture that emerges from these developments is one of a market very similar to PV up to a decade ago, with plentiful money to spend on innovation and lots of players seeking to rapidly reduce the cost of products. If the two industries follow a similar course, then energy storage is about to hit a tipping point similar to the one that brought PV prices crashing down. When that might happen is still anyone’s guess. Battery manufacturing is rapidly developing economies of scale owing to demand from the automotive sector. The carmaker Tesla is planning to build a ‘gigafactory’ that will reduce lithium-ion battery costs 30% by 2020. The growth of residential-scale battery storage could also lead to economies in battery manufacturing, inverters and management systems that could be applied to larger, grid-connected systems. Mandated energy storage in California and potentially other renewable energy markets will encourage technology developers to come up with lower-cost options. In addition, CSP strategists should consider that cost-effective battery storage can be added to wind farms, too, setting them up as potential competitors to CSP as well. Since wind is cheaper than PV, this could be an even greater threat. Grid-scale electrical energy storage cost reductions fail to live up to expectations while efforts to cut TES costs bear fruit. CSP with TES maintains its competitive advantage over PV with batteries. Battery storage costs fall rapidly and batteries begin to be used widely in grid-scale PV projects. CSP with TES loses its competitive advantage. Battery storage costs fall but its use in grid-scale solar projects is restricted for technical reasons such as TES providing valuable spinning reserves or the greater land resources needed for batteries. CSP with TES maintains a competitive advantage but remains at risk. Because of the emphasis on battery storage research highlighted above, the first of these scenarios appears highly implausible. How far and how fast the second scenario plays out is difficult to say at present. Francisco López Banderas, of Magel, which has experience of the CSP and PV markets, says solar-thermal power with TES is still by far the cheapest option for multi-megawatt scale plants in high direct normal irradiation areas. “You need to look at the scale at which each technology is competitive,” he comments. The costs for battery storage rise almost in proportion with the size of a plant, he adds, while molten salt storage can scale massively without incurring much additional cost, since the main difference is the volume of the tank. Furthermore, molten salt storage is known to last for the lifetime of a plant, whereas the upper limit of battery life spans is still an unknown. For this reason, it seems unlikely that PV with batteries will pose much of a challenge to grid-scale CSP with TES in the next two years or so, even if battery technologies experience a drastic reduction in price. Within five years, however, it is reasonable to expect battery prices to have reached a point where their use with PV could pose a serious threat to smaller CSP projects. For larger projects, however, the third scenario above is still likely, particularly if TES itself has gone down in price. But looking to 10 years from now, if energy storage achieves its full potential then the whole landscape for power generation and distribution could change drastically. Ubiquitous storage would mean any form of energy could be stored and despatched at will, removing any competitive advantage for costlier forms of dispatchable generation. This being the case, the CSP industry may need to think carefully now about strategies to cope with the day when TES is not longer a selling point. Deign, J., 2014. Dialling up profits in the base station business. Energy Storage Report, Feb 26. Available through http://energystoragereport.info/mobile-world-congress-base-stations/ [Accessed 11 June 2014]. Ayre, J., 2014. Germany’s Residential Battery Storage Subsidy A Success — 4,000 New Systems In 1st Year. CleanTechnica, May 18. Available through http://cleantechnica.com/2014/05/18/germanys-residential-battery-storage-subsidy-success-4000-new-systems-1st-year/ [Accessed 11 June 2014]. Vorrath, S., 2014. Solar storage market tipped to boom in Germany. RenewEconomy, March 25. Available through http://reneweconomy.com.au/2014/solar-storage-demand-tipped-boom-germany-15695 [Accessed 11 June 2014]. Ammon, M., 2013. Electricity Storage & PV: Current Status & Market Overview Germany. EuPD Research, Jun 20. Available through http://www.ibesalliance.org/fileadmin/Downloads/pdf/IBESA_Presentation_Ammon_ISEU2013.pdf [Accessed 11 June 2014]. Barnhart, C. J. and Benson, S. M., 2013. On the importance of reducing the energetic and material demands of electrical energy storage. Energy Environ. Sci., 2013,6, 1083-1092. Rive, P., 2014. Put Battery Storage in the Hands of Grid Operators. SolarCity Blog, April 16. Available through http://blog.solarcity.com/put-battery-storage-in-the-hands-of-grid-operators/ [Accessed 18 June 2014]. Stone, M., 2014. Redox flow batteries for energy storage. Energy Storage Report, Jun 11. Available through http://energystoragereport.info/redox-flow-batteries-for-energy-storage/ [Accessed 18 June 2014]. Reilly, R. B., 2014. Clean tech lives! Energy storage startup Ambri reels in $35 million. VentureBeat, April 30. Available through http://venturebeat.com/2014/04/30/clean-tech-lives-energy-storage-startup-ambri-reels-in-35-million/ [Accessed 18 June 2014]. Herndon, A., and Martin, C., 2013. Silicon Valley Shifting to Power Grid After Solar Sours. Bloomberg, Feb 25. Available through http://www.bloomberg.com/news/2013-02-25/silicon-valley-shifting-to-power-grid-after-solar-sours.html [Accessed 18 June 2014]. Lacey, S., 2014. Storage Is the New Solar: Will Batteries and PV Create an Unstoppable Hybrid Force? Greentechmedia, Jun 16. Available through https://www.greentechmedia.com/articles/featured/Storage-Is-the-New-Solar-Will-Batteries-and-PV-Create-an-Unstoppable-Hybri [Accessed 18 June 2014]. Deign, J., 2014. Why you might want to give up this year’s profit. Energy Storage Report, Jan 22. Available through http://energystoragereport.info/abb-battery-market-prices/ [Accessed 11 June 2014].